What prompting trends are you foreshadowing for the broadcast industry? Customers are requiring the need to be more versatile in the way they use prompting solutions in their respective production workflows. Providing hardware and software that will work in all aspects, whether it is in a studio or on location, is a must in order to reach this goal. We are finding more and more requests for a system that will operate with manual and robotic support systems without the need to keep interchanging mounting applications. These are the requirements and feedback we are receiving from customers, so having systems that meet these trends has been a major factor in CueScript’s product development. How important is the relationship between prompting hardware and software? An end-to-end solution for any customer is critical. Asking them to use hardware not designed for prompting applications that is simply and cheaply shoehorned in, is not a solution but lazy R&D. Plug-and-play controllers that work out of the box and provide 100 percent reliability are key factors in a mission critical prompting application. The next generation of prompting controllers need to offer even greater control for the operator. What prompter and/or software features and capabilities should buyers keep in mind for seamless integration and cost-effective expansion of their operations? Future proofi ng or ROI. These are the buzz words thrown around by many, but to put this into actual practice and demonstrate this in practical terms is another thing. Our goal at CueScript has been to develop software for today’s requirements, but most importantly with an eye on tomorrow’s broadcasters’ production needs. Being a brand new company, but with a vast collective prompting knowledge and experience, our software solutions are designed to integrate into today’s available technology and allow for future expansion. Providing systems that work in all production environment’s and not having a “that will do” attitude is key in any purchase process. When purchasing a teleprompting system/solution, how important is the customer service aspect? Customer service is key. From the initial contact to the installation. Every step should be easy and if at any time contact is required, then speaking to the right people with the right knowledge is a given. Most importantly, providing systems that are designed for purpose and not off the shelf solutions, is another important aspect in support. If you are not in control of your own supply chain, how can you support your customers going forward? What are some of the biggest challenges/ upcoming obstaclesfacing broadcasters today, in terms of teleprompting? A key factor for any broadcaster is support. With broadcasters relying heavily on manufacturers to provide more service support, choosing a vendor that is able to support and understand the needs of the user are essential. This is even more important to the broadcaster when some prompting vendors cheapen the solutions offered. Prompting is mission critical and care should be taken when choosing an end-to-end solution. What does CueScript have planned to help customers meet its evolving prompting needs? CueScript was founded on the desire to provide to the industry creative teleprompting hardware and software solutions with innovative feature-rich designs for all broadcast production needs including live and studio environments, as well as the needs of ancillary markets such as education, multimedia and corporate. 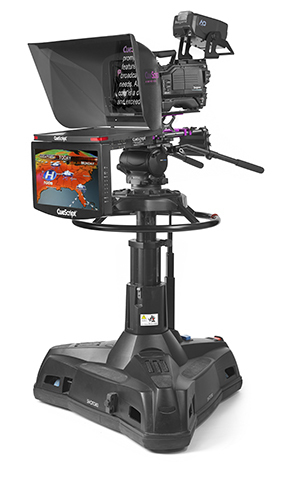 We built our fl agship line of CSM LED High Brightness HD- SDI Prompter Monitors from the ground up. User-friendly features such as the built-in standard LED cuelights and low-power consumption and start-up, were based on our collective experience working closely with customers, vendors and OEM partners for nearly 30 years. It has been our goal since the beginning to offer up the best possible solutions based on real-life needs. Now, as we prepare for the upcoming IBC 2014 show, we are gearing up to roll out a variety of innovative solutions based on the trends and challenges we are seeing in the industry. A few of our new introductions include the iT Production and iT News software, featuring a system unlike any others on the market, as well as the patentpending CSSC1 Controller Device and a host of additional accessories all geared towards aiding customers now and into the future.